If you have known me for any length of time, you probably know that I am a huge fan of Make: Magazine. 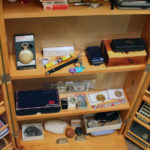 Their publication is full of interesting, cool projects that you can make yourself. 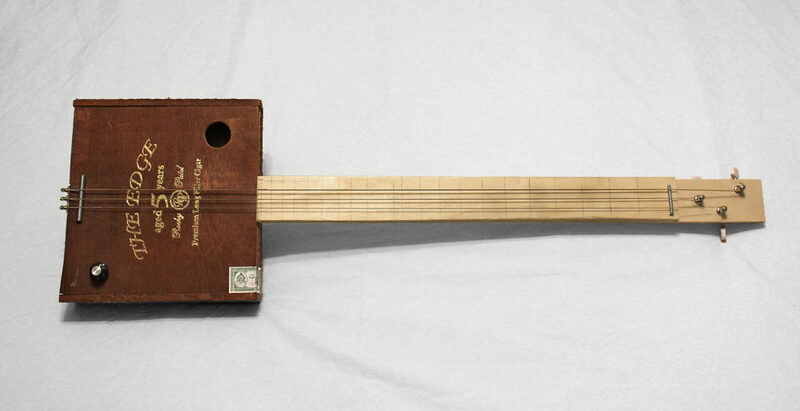 When a friend gave me a couple of empty cigar boxes, I knew right away that I wanted to try my hand at making a DIY cigar box guitar! There are a lot of resources to help you with making your own cigar box guitar. 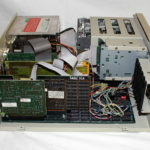 I relied heavily on Make: Magazine issue #21 as well as CigaxBoxGuitar.com and CBGitty.com. Their guides and information pointed me in the right direction. 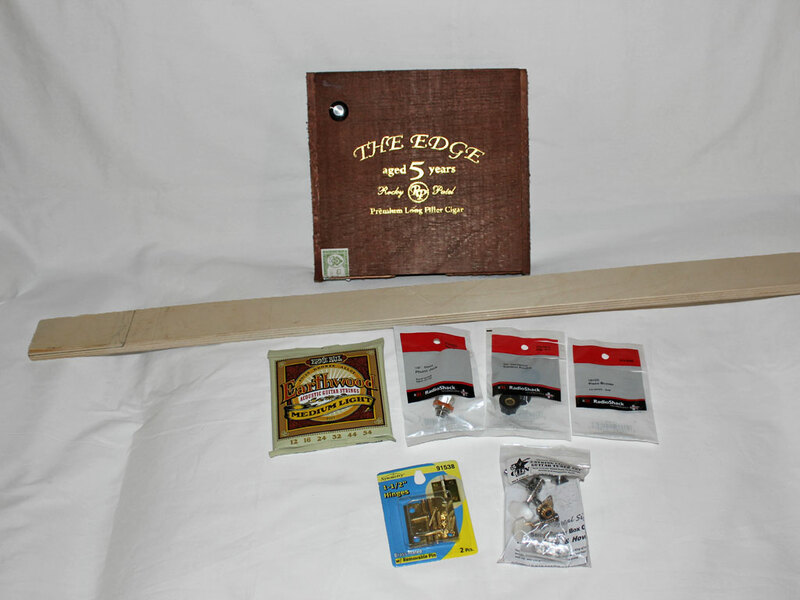 The first thing I did was select the largest wooden cigar box from the ones my friend gave me. 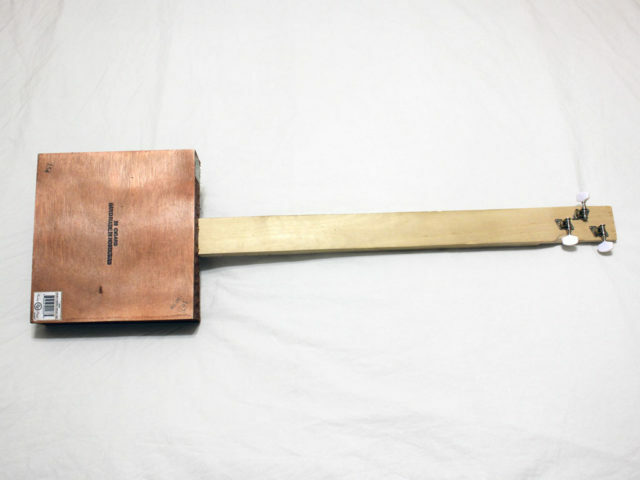 It measures 8 1/4″ x 9″ and is about 2″ deep. 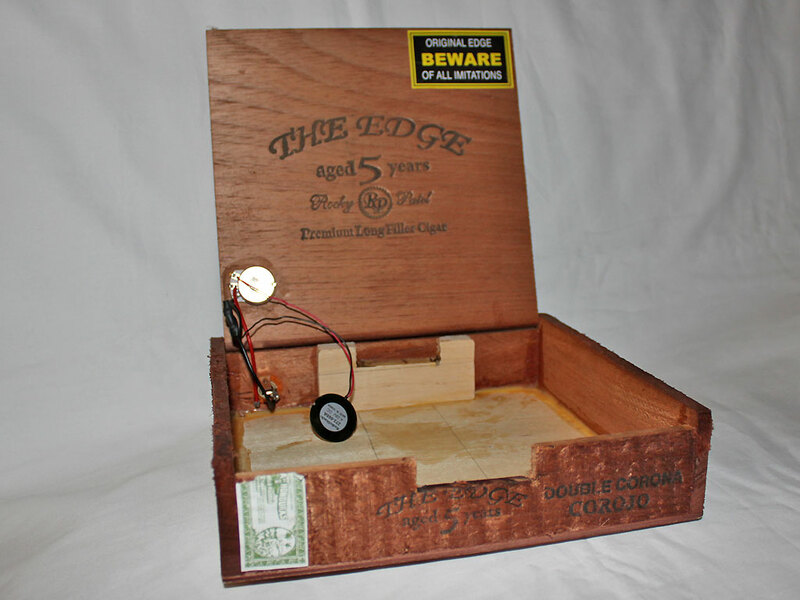 Most cigar boxes are not as square as this one, but I chose to work with what I had. Next, I found some scrap plywood in a dumpster. 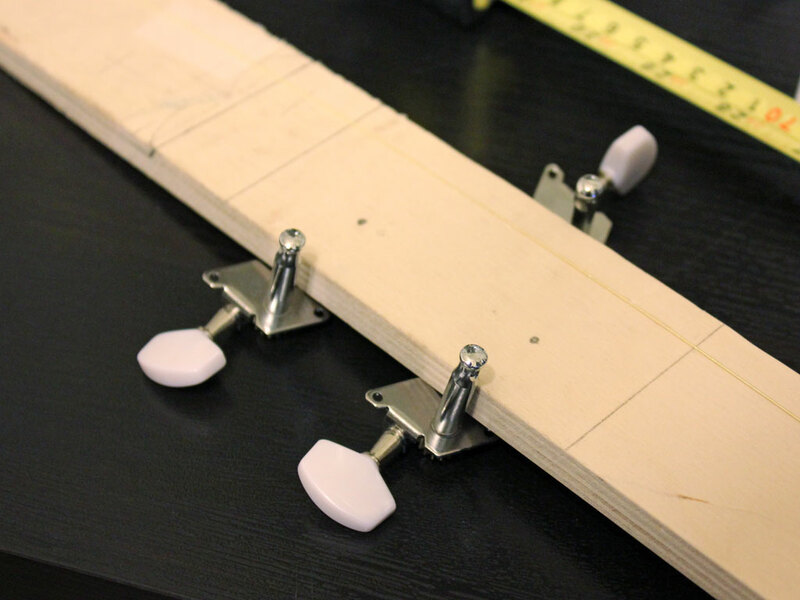 I cut it into 2″ wide strips for the neck, but unfortunately the wood was only 1/2″ thick. The solution was to glue two pieces together for the neck. At this point, it was time to buy some supplies. I decided that I wanted my guitar to be electrified, so I purchased the necessary parts including a 500K ohm potentiometer (for the volume control), a piezo pickup, a knob, and a 1/4″ jack from Radio Shack. 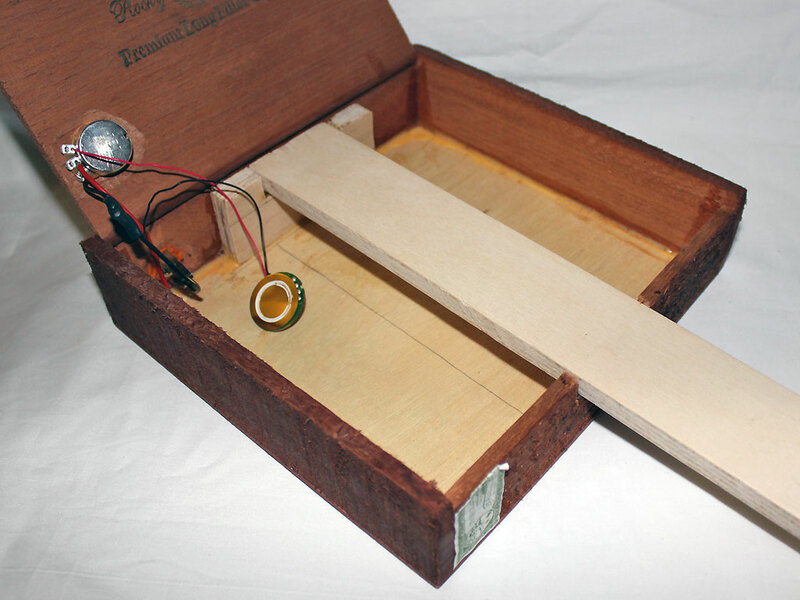 The box I chose had a lid that was about 1/4″ thick, which made it tricky to mount the audio jack and potentiometer. I used the sanding wheel on my Dremel tool to thin out the wood in those areas and get both of them mounted. 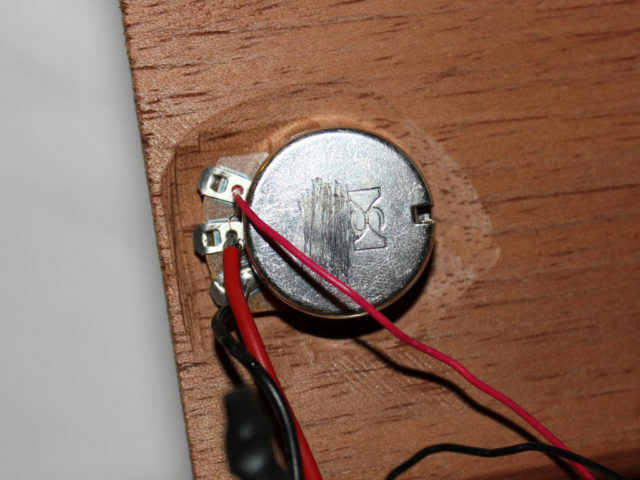 I also cut a 1-1/4″ sound hole in the body using a hole saw kit from Harbor Freight. To mount the neck, I made a wooden insert and glued it inside the box. I sealed the inside edges of the box with wood glue. The neck was attached to the body with wood screws and framing nails (not shown in the picture). I chose to mount the piezo directly to the neck using double-sided tape. For the tuners, I purchased a 3-pack of them from CBGitty.com. There were a couple of issues when installing them. First, I almost made the grave mistake of lining two of the tuners up directly! You want to make sure each string will not interfere with the others. Next, one of the tuners did not stick out far enough past the neck to turn, so I had to make a notch in the neck using the Dremel tool. 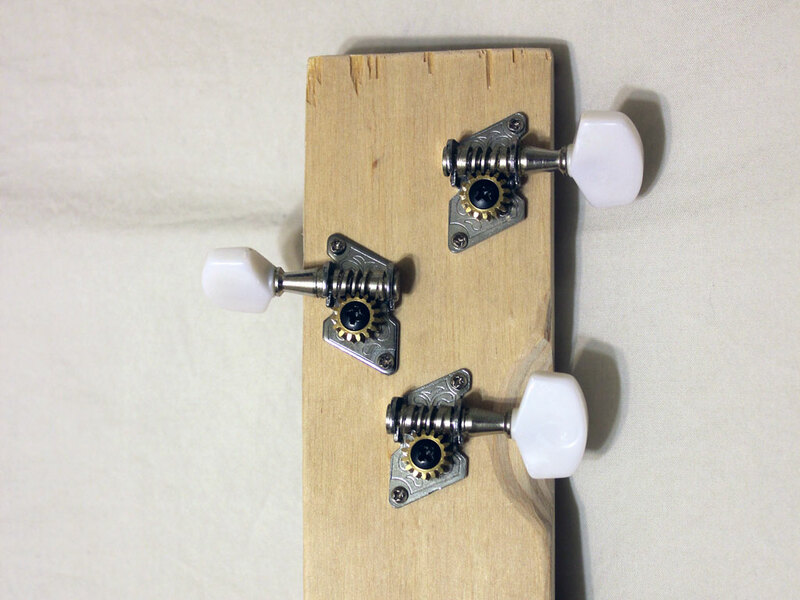 Finally, I found that it was much easier to attach the tuners to the neck if I pre-drilled the screw holes. Attaching the strings proved to be a challenge as well. I went to Home Depot and looked for a cabinet hinge as shown in the instructions, but I just could not find one! After searching around the store, I found a 100 lb picture hanger with three small holes that was perfect for a 3-string guitar! After flattening it with a hammer, I had a way to mount the strings. To raise the strings up off the neck, I chose two bolts from my scrap bin and cut the heads off using the metal cutting wheel and my Dremel. This put the strings at the perfect height! 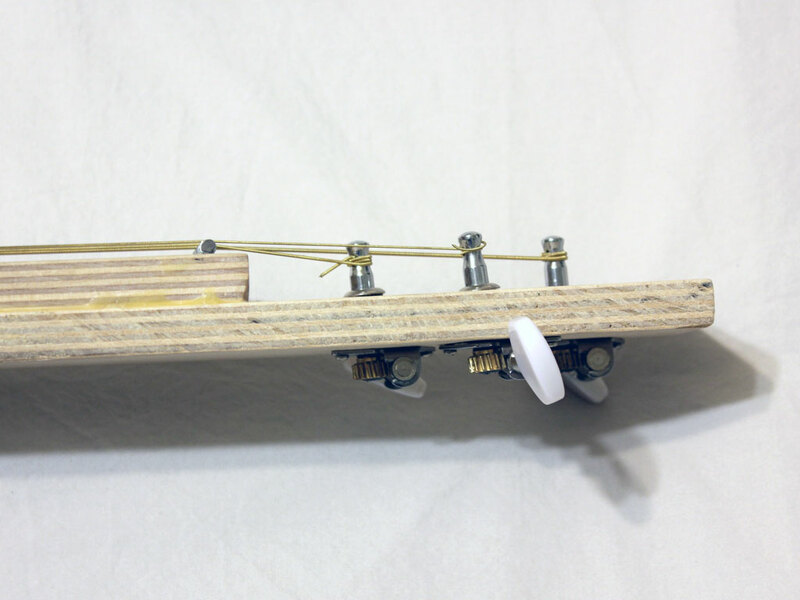 The bolts are held in place by friction and are not attached to the guitar in any way. I chose not to add frets to the neck for simplicity’s sake. 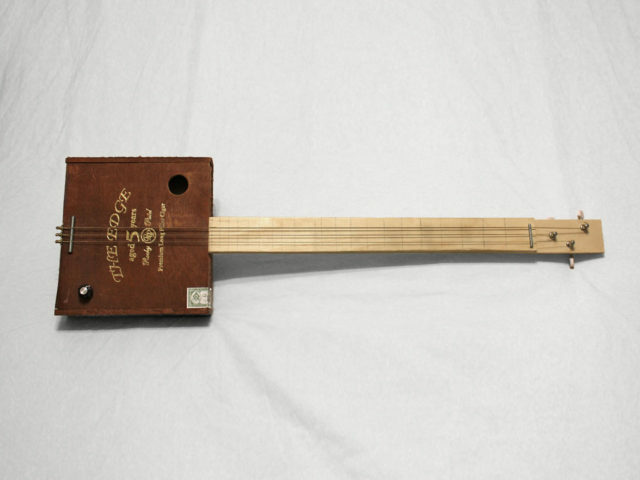 I am still working on fashioning a homemade slide out of the neck of a glass bottle, which will make playing the slide guitar much easier. The neck was sanded smooth with 150 grit, then 400 grit, then 1000 grit sandpaper. I have not yet stained or sealed it with any kind of chemicals, and I’m not sure I need to. 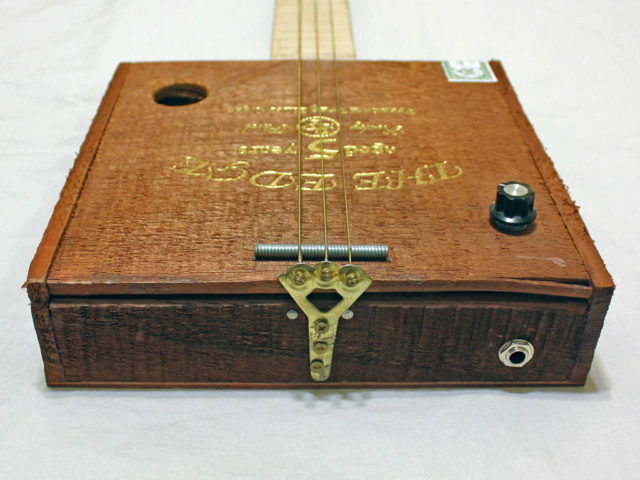 When everything was finally assembled, I had a friend help me string it up and we tuned it to Open G tuning (the most common tuning for cigar box guitars). This was a really fun project to work on. It gave me a lot of new challenges and helped me better understand how guitars work. I also love the philosophy that it should be made as cheaply as possible from found or scavenged objects, so there’s really no “wrong way” to build one! I am already thinking about building a homemade amplifier (featured in Make: Magazine #09) to go with it! Originally Published: July 29, 2012.